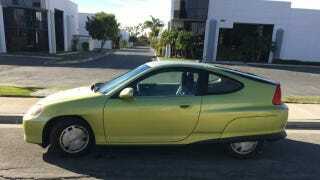 Could This 2000 Honda Insight Be Your Lean and Green MPG Machine? I’m certainly not breaking any new ground when I say that a lot of hybrids lean towards the boring side. With a few exceptions, the styling tends to fall somewhere between “egg” and “space egg.” But what if you wanted a car that looked like someone made a Blade Runner prop out of a late-90s Honda? Then this 2000 Honda Insight located in Camarillo, California might be for you. It’s not secret that the first generation Honda Insight looks weird as hell. It has bodywork covering the rear wheels like a Cadillac from the ‘70s and a unique aerodynamic tapered design that takes the concept of function over form to its logical conclusion. This one specifically is painted in what the seller says is “Citrus Yellow” which translates to a sickly green and makes the car look like it has scurvy. This generation of Insight is legendary for its fairly unheard of fuel economy. It’s not uncommon to get more than 60 mpg just cruising down the highway. The more popular Prius of the same era would struggle to reach that. This is due to its very aerodynamic shape and low power hybrid drivetrain. Its three-cylinder engine and electric motor make somewhere a little north of 90 horsepower. The fact that it’s Green™ also adds four miles per gallon. The interior pretty much consists of some seats and that’s about it. You aren’t paying for comfort. However, the Insight is equipped with a very late 1990s digital dash that looks like it came straight out of Goldeneye 007. This Insight is priced at $2500. Are you willing to make everyone go green with fuel saving envy?